As news organizations embrace the distributed model, the homepage may not be the only thing they’re giving up. Journalists in digital newsrooms may be expected to focus on an entirely new form of storytelling designed to blend seamlessly into the social stream. Make that new forms of storytelling. In adapting to the distributed media landscape, news organizations need to consider the unique style, tone, and user base of each of the major social platforms, such as Facebook, Snapchat, Twitter and Instagram. Although a video may be shared widely through Facebook’s native player, it might not work as well on the numerous emerging social platforms news publishers are currently eyeing in the hopes of expanding audience. Media companies know that the mass audiences of the internet aren’t coming to their homepages. If news executives and editors want their sites’ journalism to be seen, they need to be on social platforms. Some companies see this not just as an obligation but also as an opportunity. For example, a year after shuttering its homepage to focus on publishing directly to its social accounts, news start-up NowThis saw its video views surge from 50-60 million per month to one billion across all platforms. Publishers that embrace a platform-native approach also see higher levels of engagement with their content. Partnership deals reached with platforms can give publishers the opportunity and capital to experiment with new forms of content, like live and 360° video, for which they might not otherwise have the resources. And journalists are excited about experimenting with various social platforms, which forces them to carefully consider how their work fits best according to each one’s unique focus. “Constraints are good,” noted Allison Lichter, who led the team that launched The Wall Street Journal’s Snapchat Discover channel. What’s less clear is whether publishers are getting enough out of this relationship to justify what they’re giving up: web traffic, user data and metrics, and, ultimately, control. Millions or even billions of video views aren’t worth much when you’re not the one selling ads against them. Branded content studios are one solution—and how NowThis claims to make much of its revenue—but they’re difficult to scale. The problem is more acute for companies that rely on paywalls. The New York Times, for example, uses platform-native content to target potential subscribers, but “walled gardens” like Snapchat don’t give the organization a way to direct users back to their site. Most publishers still see platform-heavy strategies as a good bet. But each time a platform approaches a news organization with a proposed partnership, journalists need to critically evaluate whether the promised benefits will justify the time and manpower needed. And they must do so with the knowledge that platforms are fickle. 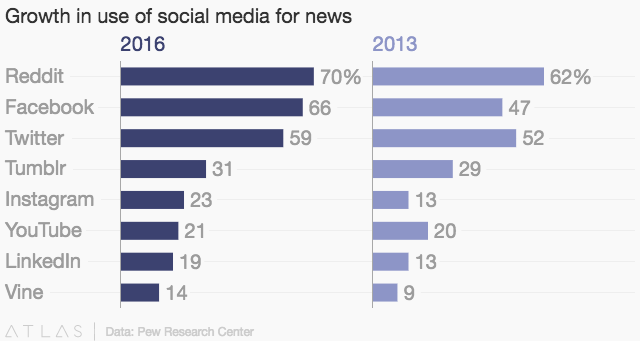 More users reported getting news on Facebook, Instagram and LinkedIn in 2016 than in 2013, according to the Pew Research Center. Users also reported getting news on Snapchat, a platform that wasn’t included in the center’s 2013 research. Newsrooms should offer unique content across platforms and leverage them as cross-promotional tools. It’s also important to build in-house tools that allow social media editors to quickly create content that’s optimized for social. And news organizations need to make their brand “big and bold enough” to resonate with users who are encountering their content off-site. Include captions. 85 percent of Facebook videos are watched on mute. Start strong: you have about five seconds to capture people’s attention. Keep in mind that emotion drives shares and engagement. Breaking news is more effective than evergreens. Mixed media helps content stand out in the scrolling feed. Use statistics and fast facts that can be understood in less than three seconds. You have 10 seconds to tell users everything they need to know (without overwhelming them). Have people “take over” Snapchat Stories to cover live events. Speak young. 86 percent of users are between the ages of 13 and 34. Be careful and intentional with the way you handle sensitive content. Avoid visually disturbing images. If you have only a low-quality video, write the newsworthy quote over a stock photo. Take advantage of the large character limit to publish in-depth stories or to bring context to bold, attention-grabbing images. News companies are beginning to recognize the need to create a new full-time job: that of a platforms director, who decides which stories are published on which platforms and manages the sometimes-delicate relationships with technology companies. While these companies are figuring out their strategies for today’s players in technology, they must also be on the lookout for the next big platforms. Some publishers are more bullish on a platform-native approach than others, as this research from the Tow Center for Digital Journalism shows. Are natural sharers and feel comfortable on multiple social platforms. Have a strong sense of what to publish on which platforms. Maintain strong relationships with contacts at different platforms. Analyze metrics to understand the number and types of users who are accessing content on different platforms. Understand the implications of partnering with platforms from both an editorial and a business perspective, including strategizing for revenue. Closely follow updates and other changes on platforms. Monitor the digital landscape for emerging platforms that make strategic sense for the publisher to be on. As a publisher, if you’re not embracing the content-everywhere approach and you’re not coming up with a way to have conversations with advertisers about how you’re going to bake their brands in content on these platforms, 2017 is going to roll around and you’ll be in trouble. If you’re not on the platforms, then you’re not seen. And if you’re not seen, then you run the risk of falling out of relevance. Say we have a piece of content and we put it on our site, on Vine, on Snapchat. Each time we put it somewhere new, we have to format and cut it a little differently and think about how that content fits on each platform. And all of that takes time. You have to be able to prioritize which platforms are going to be the most impactful. Homepage audiences are generally more engaged. Hence some of the reason for the focus, even as those audiences have diminished dramatically. But in the native landscape, there is a new hold out for hope. The audience experience is primarily off-site, meaning it’s generally native to the platform. From a product perspective, that equals better engagement. Facebook, Twitter and Snapchat are far from the only platforms in play. BuzzFeed's content, for instance, is published on at least 45 platforms and distribution channels beyond its website, according to Naytev, a company that tracks and optimizes social sharing. Featured photo by Gerd Altmann used under a Creative Commons license. Publishers are responding to the distributed media environment by creating native content in the hopes of engaging users and generating revenue. Columbia Journalism Review Who owns the news consumer? Ashish Patel is the publisher at NowThis News. Cory Haik is the chief strategy officer at Mic. AJ+ is a distributed video company with a platform-specific approach. Ready to go forth and transform journalism. Lindsay was formerly a staff writer at Salon, where she led environment and climate change coverage, and an editorial fellow at The Atlantic. Before Studio 20, she also worked with the Journalism & Design program at The New School.